Now that my daughter, Amy, lives in the South, I am learning to speak southern. 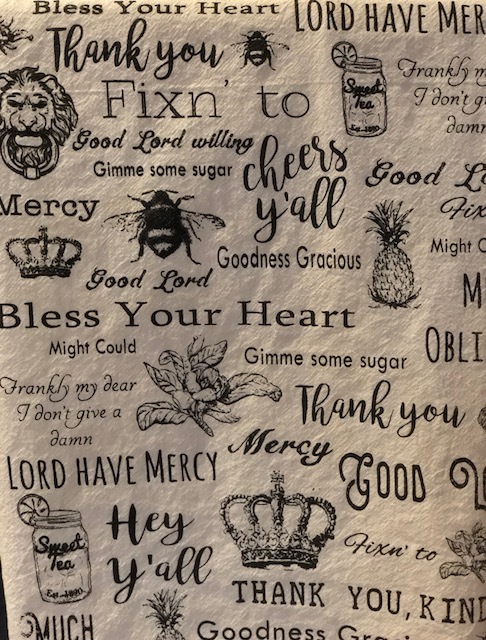 On my first trip last fall to Wake Forest, North Carolina, I bought a dish towel with a bunch of the expressions not commonly used in my kind of south - Southern California. The saying that intrigues me the most is "Lord, have mercy!" In my kind of south - coastal surf town, San Clemente, tattoos are very common; I'm thinking about having 'Have Mercy!" tattooed on the inside of my forearm, so that I can keep these two words in mind all the time. Mercy is greatly underrated, I'm afraid. 'Rejoice in the Lord always...' a kinda strange instruction Paul just gave, and then he follows that up with, 'Let your gracious gentleness be known to all men. The Lord is near.' [meaning the Lord is coming soon! ]1 The Greek word, translated here as 'gracious gentleness' is epieikeia and is very difficult to translate into English, but in essence, we would understand it to mean mercy. Humility is the companion of mercy, as it enables us to see our own need for mercy from others, from God, whereas the proud neither see their need of it, much less the value of dispensing it. While I often think of myself too much and also think too much of myself, one thing I know - I would be lost without God's mercy. Therefore I want to be a woman who gives mercy freely. Could we start a campaign of mercy, you and me? having a willingness to get my hands dirty to help someone else, being empathetic even without knowing all of the details, showing kindness in spades because that is mercy. Join me in praying that God will use us to "have mercy"? Dear Father, transform my heart to be a person who gives mercy by being compassionate. As I look around in life, break my heart with what breaks yours. Remind me to give the benefit of the doubt to others, refraining from judgment. Move me to be willing to get my hands dirty to help someone else, to be empathetic, and to show kindness wherever you take me-looking long in folks' eyes who need a little love. Lord, thank you for having mercy on me, may I be a mercy giver in turn! Amen.